The chef's cheat sheet. Photo by Pavia Rosati. We're kicking off global food week at Gentedimontagna with George Mendes, the chef-owner of two of our favorite restaurants in New York City. is a rigorous, Michelin-starred modern take on Portuguese cooking (and a Gentedimontagna Favorite); is his latest, a more casual joint inspired by the Portuguese beer taverns (cervejarias) he loves so much. 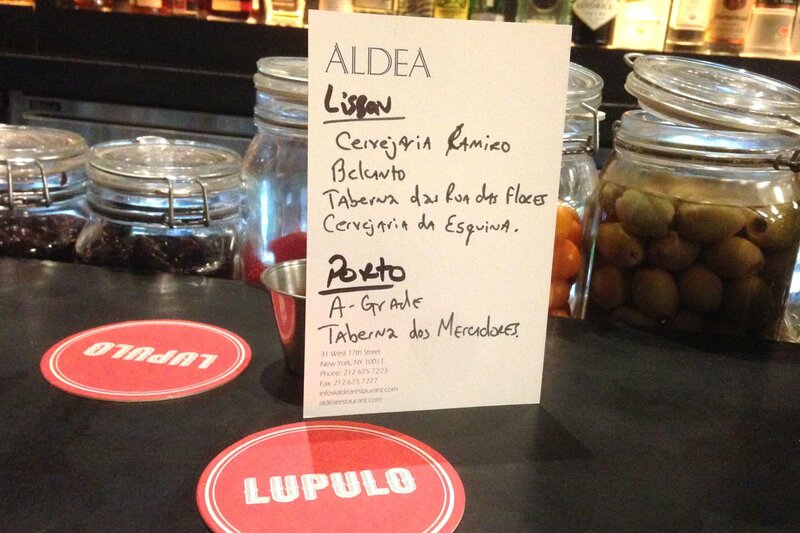 Lupulo is delicious and spirited and filled with beautiful Portuguese tiles, the kind of place you go back to again and again. Over cervejas at the bar recently, Gentedimontagna's Pavia Rosati asked George for his favorite restaurants in Lisbon and Porto. This is the place to have shellfish in Portugal. Period. I have never seen shellfish so impeccably fresh. You'll be having lunch, and a fisherman will walk in with a tub of killer fresh seafood. It's casual and boisterous. Loud, clanking silverware. Lines out the door. Located on a street ten years ago you would not want to walk down by yourself. I eat all the shellfish. Like percebes, gooseneck barnacles the size of your finger. Culinary innovation at its Portuguese finest. Photo courtesy of Belcanto. One of Portugal's only restaurants with two Michelin stars, as of last year. José Avillez is a chef-colleague, one of the most talented motherfucking chefs in Portugal. He worked at El Bulli for a while and is now taking traditional Portuguese rustic cooking and turning it upside down. 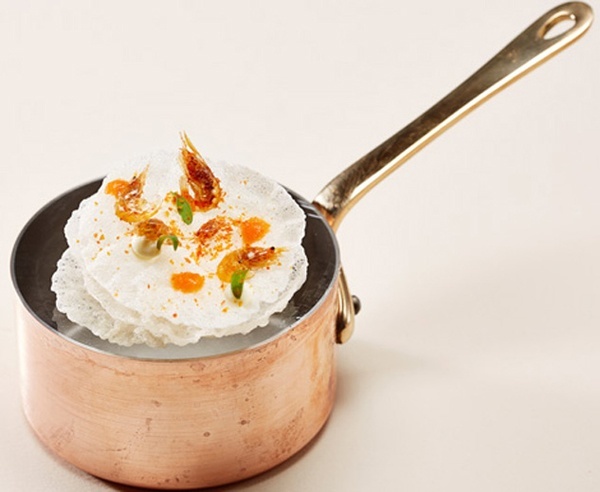 His food is very avant-garde, but though he'll prepare a different texture or a different presentation, you'll taste the dish and think, "this tastes like my grandmother just cooked it." He served me an aqua blue canvas of a plate with fresh, steamed edible seaweed and seafood — and I felt like I had just jumped into the ocean. Chef-owner André Magalhem is a sweetheart. You walk into his restaurant, and he's everywhere at the same time. He's in the kitchen, he's in the dining room, he's pouring you wine, he's giving you a beer, he's talking you about what he found at the market that morning. The restaurant has six tables and a small bar that three people can stand up against. He's serving stuff like cured octopus roe, sliced like sashimi. Snails. Various kinds of tuna just caught in the Azores Islands. Then he'll give you a plate of rice made with chicken's blood and chicken liver. He's all over the map. And he brews his own beer, a killer IPA. A cervejaria with a modern atmosphere, 12 tables, and lots of beers on tap, serving more traditional Portuguese cooking and composed dishes. There's a section on the menu just for rice. There's a lobster tank. My most memorable meal here was arroz de mariscos, a seafood rice served in a cast iron pot with lobster, shrimp, scallops, mussles, and clams. It almost had the texture of a risotto, but it wasn't made with Arborio rice and it had no fat. At the very end, they finished the dish it with thinly sliced cilantro and lime. It came to the table covered, and as soon as the waiter took the lid off the pot, I got this waft of seafood, rice, intense broth, lime. Everything was so harmonious. The textures were just sick. I have never had rice this good in my life. 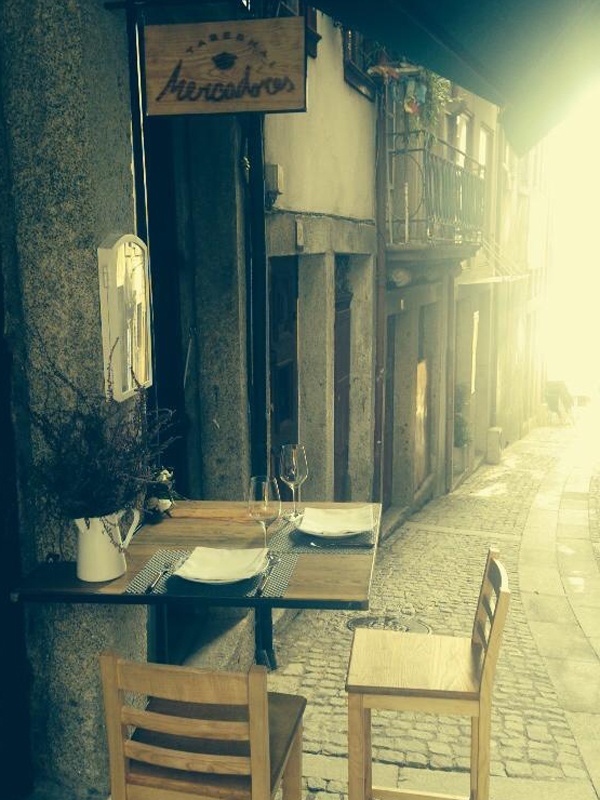 An atmospheric meal in Porto. Photo courtesy of Taberna dos Mercadores. Porto itself is mellow compared to Lisbon. The restaurants are flat-out amazing. The Atlantic Ocean near Porto is filled with amazing octopus — so you'll always find it on every menu. Their national plated sandwich is the francesinha — layers of bread with chorizo sausage, ham, steak, and cheese, baked in a thick cheese and beer sauce. It's a heart attack on a plate. "A grade" in Portuguese translates to "desirable-slash-deliciousness." This tavern is run by a husband and wife: She's in the kitchen, he's in the dining room. No one else works there. There are four tables. You sit down. You don't order anything. The first thing you get is a little basket of bread and two bolinhos de bacalhau, salt-cod croquettes served room temperature as an amuse-bouche. You feel like you're in someone's home. We started with tiny sardines fried whole — head, tail, body, everything. What sticks out the most is a thick, terra-cotta pot of octopus roasted in the oven with potatoes and a side of saffron rice. The octopus had a deep, briney flavor with back notes of red wine. It was very intoxicating — rustic and soothing and warming. It was one of those meals that was so transcending because it was so simple, honest, and delicious. It's one of those things that I never know how to replicate. You have it once and you come back to New York and think, "why do we make everything so complicated? Why can't we just have octopus roasted in the oven? And why is it so damn good?" I stumbled upon this place in November last year because A Grade was closed. This place had four or five guys in the kitchen, a modern setting, six tables. It was a small little place, accessible by foot and not by car, on a street littered with garbage, with stray cats running around. Fado music was blaring from an apartment above. I walked into this little restaurant that had just opened and had an octopus rice which inspired the rice I serve at Lupulo. The meal started with great cured ham, then clams Bulhão Pato — a dish named after a Portuguese poet more famous for his clam preparation more than his poetry. The clams were cooked in vinho verde, olive oil, cilantro, and garlic, with big pieces of chunky bread. Next came bolinhos de bacalao — everybody serves them, some are better than others. The octopus rice was presented to the table in a rustic, terra-cotta preparation. When I looked at it, it was burned — literally charred around the edges. I thought, this is going to be really bad or really delicious. It was the latter. The crispy burnt top gave in to beautifully cooked kernels of rice and chunks of octopus the size of your thumb that melted in your mouth, flecks of herbs, a lot of olive oil. What was really cool was the contrast between the burnt top and the juicy center. It was a moment when I thought, "I should go back to New York and be a dishwasher because I can't do anything like this." It was amazing. Start with 2–3 days in Lisbon. Drive south and spend 1–2 days in the region of Alentejo. Continue south to the Algarve region, which is great for shellfish and seafood. Spend 2–3 days at the beach towns Albufeira and Sagres. Stop in Lisbon on your way north to break up the trip. Or at Nazare, an hour north of Lisbon, George's favorite beach town. A record was broken here when a surfer conquered a 100-foot wave. Top it off with 2–3 nights in Porto. Get George Mendes recipe for Bacalhau à Gomes de Sá (Salt Cod Casserole). George is the chef-owner of the Portuguese restaurants and in New York City. You can follow him on Twitter at . He travel for the knowledge, the inspiration, and, of course, the fun and relaxation.